Lately I've been thinking a lot about wedding shoes–colorful, or white? Peep toe or pump? 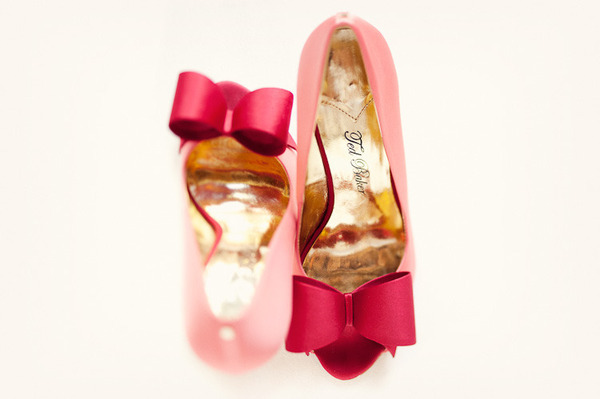 But this pair of pink Ted Baker beauties stops me in my tracks–isn't that bow delicious? I'll take a pair in every color! I'd love a punch of color if it came in this form. Love. Did you see my post yesterday? Now I have to keep the pink shoes! I'd buy these even as non-wedding shoes! Love! two shades of pink in one shoe- perfection!!!!!! Those are beautiful! Speaking of colorful shoes, Anthropologie makes these gorgeous ombre flats in almost the same colors! Ok,these may be my fave pair of shoes you've ever posted, ever! Stop by & enter my Shabby Apple $50.00 Giftcard Giveaway! If my glasses weren't already bright, I'd have definitely chosen colorful heels!! With all the gorgeous beauties that you post ever week, it's no wonder you've got too many amazing options to choose from! I wore pumps the colour of my bridesmaid dresses (a red wine colour) and I loved the pop it brought to my attire. It was like a little secret that came out to play every once and awhile...and I loved it so! Ohhhhh my!!!!! I love this image!!!!!!! Delicious is the perfect word! Love the two hues! I love the two-tone. And anything with bows...well, those are obviously adorable. Holy crap - those are insane! Oh, these are definitely my favorite shoes ever! These are amazing!! I want them! !